Gods of Asgard is an award-winning adaptation of the Norse myths by American artist and author Erik Evensen. 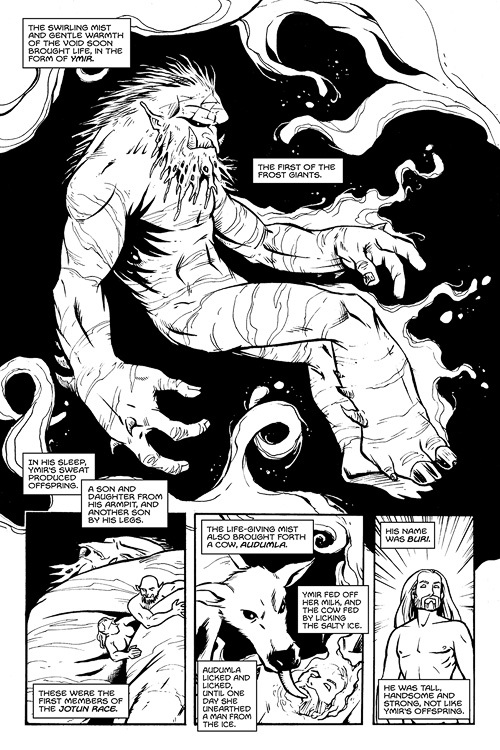 First published in 2007, the 164-page graphic novel tells tales of the mythology from Creation to Ragnarök. Well-known stories of Odin, Thor, Loki, Freya and other gods and goddesses (and dwarves and giants) are presented in new interpretations that honor the originals. Erik writes that “it was my goal to stay as true as possible to the original source material.” His success is shown in the fondness that both fans and scholars of Norse myth have for the book. 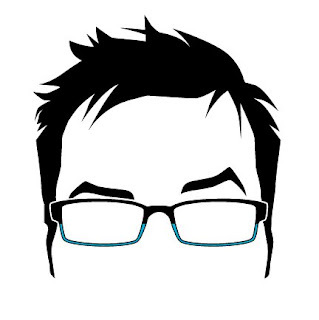 Erik holds degrees in art and design from the University of New Hampshire, School of the Museum of Fine Arts (Boston) and Ohio State University. He has taught at the Art Institute of Pittsburgh, Bemidji State University and Ohio State University. In addition to Gods of Asgard, Erik’s comics art has appeared in Fear Agent, Grounded, Invincible, Johnny Raygun and Zombie Bomb. KS - How did you first become interested in Norse mythology? EE - I was a pretty voracious reader when I was a kid, and my family constantly plugged different books into my hands. D’Aulaire’s Norse Gods & Giants was my first Norse mythology book, and I just kept on going. I know its connection to my own Norwegian roots and my fascination with Vikings and pirates also helped. The D’Aulaires influenced me hugely, and many little ideas of theirs worked their way into my own book. KS - Could you explain your idea that “the Norse creation myth . . . mirrors concepts from other religions”? EE - I think all I meant by that was that many of the elements are similar to those of other cultural beliefs. The gods create humans out of inanimate material and give them life. Odin and his brothers create the world itself out of the dismembered bits of Ymir, evoking ideas of Gaia. All of this begins in an abyss. Many of these elements are paralleled in Greek and Egyptian mythology in different ways, though not necessarily in the same way, order or fashion. KS - How do you feel Norse mythology differs from Celtic, Greek and Egyptian mythology? In your view, how do the gods express the landscape, culture and psychology of the northern world? EE - It’s generally accepted that the Norse worldview was decidedly bleaker, harsher, maybe even darker. They lived in an area that was practically in darkness half the year, and the winters and landscape were full of weather, terrain, and wildlife that easily claimed lives. That’s not to say they were a nihilistic people, of course, just that their reference frame for understanding the world wouldn’t be the same as that of a people living in and around the Mediterranean. A lot of the popular imagery of the Norse gods borrows heavily from classical mythology and Victorian conventions, and I’ve tried to strip away a lot of that. Of course, I’m always learning more and more, and unlearning some of what I’ve learned, and I know I’d do things a little differently even now. I know I have some classical influences and misconceptions in my own book. KS - The word jötunn is usually translated into English as giant, which conjures images of Bunyanesque titans. You have a more sophisticated view of these ambivalent figures and relate them to huldefolk, nisser, tomten and trolls – as well as “the forces of nature and the forces of chaos.” How do you characterize the relationship of the gods and the giants? EE - Well, to me, the jötnar and the gods are the same idea – manifestations of forces, elements and concepts. The jötuns seem to tend toward the elemental side of things, with the most common being frost-giants, storm-giants and the infamous fire-giants of Muspellheim. The gods are more about concepts, such as wisdom, fertility, battle and inspiration. In this way, the gods represent the traits of human beings, while the jötuns represent chaotic, natural forces. I like to think of the jötuns as predecessors of huldefolk and their counterparts because I think they serve the same purpose, and essentially have the same conceptual roots. Peer Gynt’s journey into the mountains mirrors Thor’s journey to Utgard, for instance. I also see a similarity in how a huldra can be beautiful and enchanting and lure human men into coupling or marriage, and how several of the gods took the beautiful daughters of ugly frost-giants as their wives. 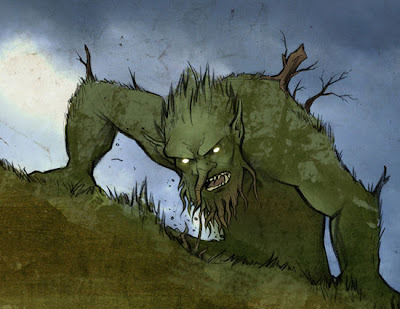 I treated the jötnar as a primeval versions of the trolls, et al., from more modern folklore. KS - Your giants and dwarves exhibit bestial traits throughout the book – animal feet, claws and whiskers. Why did you portray them in this way? EE - I wanted a way to visually separate the giants, dwarves and trolls, so we’d have a clue as to the nature of different characters. I didn’t want this to be terribly off-the-wall, so I gave them some of those bestial traits to “otherize” them in comparison to the gods, who were designed to be human looking. Obviously, some of them (such as Loki or Skadi) look more human-like than others, but they always have the same “tell” of their counterparts – usually pointed ears. I took the idea of this visual signifier from the huldra, who had cow tails or bark-covered backs. There’s always a little clue to let you know they’re not of our world. KS - Why did you decide to use Snorri Sturluson’s Edda as your primary source – as opposed to the Poetic Edda, Heimskringla or Gesta Danorum? EE - Snorri is a pretty good storyteller, for one! But also, a lot of these sources kind of contradict each other in places, and different stories have different traditions. The stories are great, as we all know, but I had to make a lot of decisions in order to unify certain ideas and elements, and give the book a modicum of structure. I admit, it did make it easier to do this by leaning on Snorri a bit, since he did this originally. I deviated from Snorri a bit, but not as much as I originally thought I might. KS - In typical medieval scholarly fashion, Snorri sought to organize the contradictory poetic fragments of Norse mythology into a coherent whole. 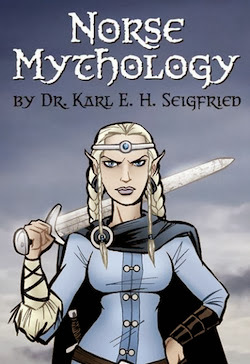 Likewise, you write that you “have attempted to rectify some of these contradictions for the sake of the narrative.” We know that Norse mythology reflects elements of pre-Christian religious practices throughout continental Europe, Scandinavia and the British Isles over a very long period of time. What is the end result of trying to make a coherent storyline out of material from such a large geographical and temporal range? EE - Well again, leaning on Snorri helped because he had done it before, but when I started the project I didn’t realize the extent of the incoherence! It’s one thing to read the myths – even differing versions of the myths – and it’s another entirely to try to make sense of them in written and illustrated form. What decisions do you make? Why do you make them? 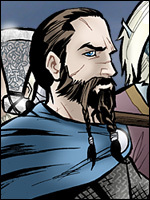 Is Tyr going to be Odin’s son or Hymir’s son? I wanted to create something of an arc for the book as a whole, but I also wanted to maintain as much authenticity – or at least sincerity – as I could. KS - Your book is, in a way, an interpretation of an interpretation of a transcription of an oral tradition of an ancient belief system. With all these intermediate stages, what relationship do you think Gods of Asgard has to actual religious beliefs before the conversion to Christianity? 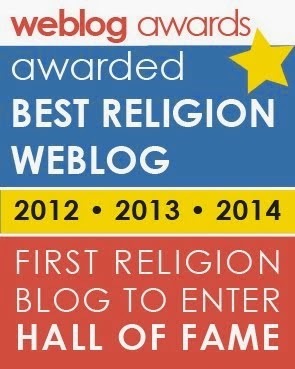 EE - I’m not a comparative religion scholar or a practitioner of Ásatrú, so I wasn’t even thinking about that end of it. It probably has only a very fuzzy resemblance. Like in the days of VHS, when you’d copy a movie off the TV, then copy the tape for a friend, then they would do the same – until you were several generations removed from the source. I watched a friend’s tapes of Apocalypse Now and Dune and had no idea what I was looking at the entire time. I remember fuzzy images of sandworms and helicopters and little else.